This was my first race back in almost a year and a half since having my baby girl. 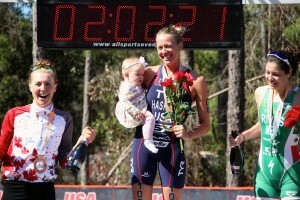 I remember watching this race at five months pregnant last year! 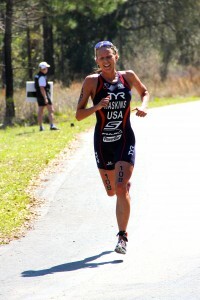 My mindset heading into this race was to test myself, race hard and have fun. 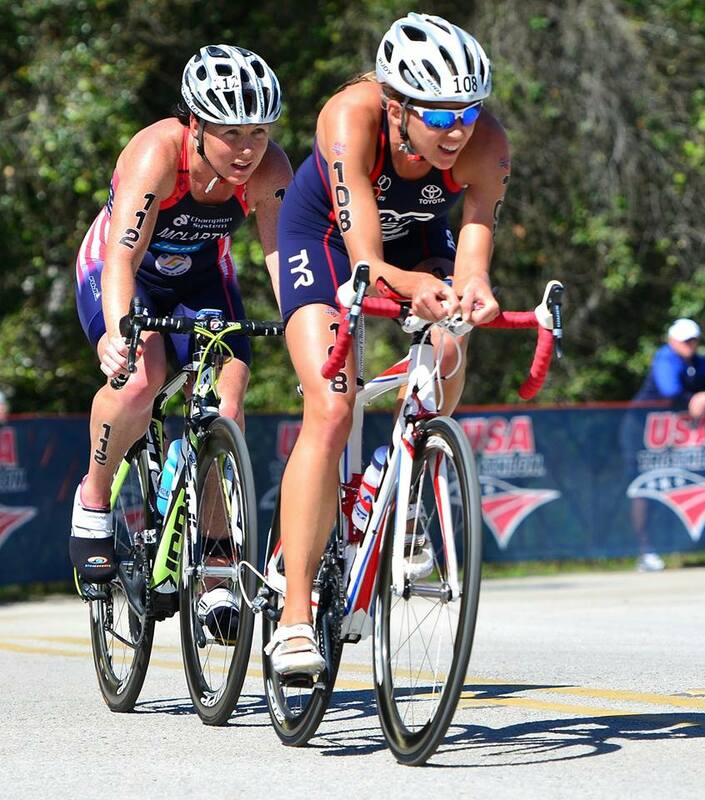 This race is very early in the year, so an ITU sprint race is a great opportunity for some speed work on the swim/bike and run. I loved the fact that the race is just ten minutes from home. 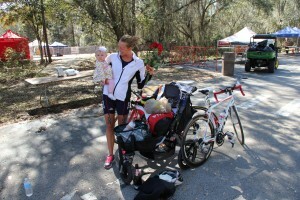 This made it easier to bring all our baby gear and race gear (although that remains to be a challenge!). 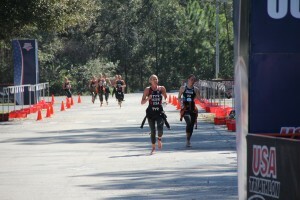 I have raced this race in 2010-2012 and every year it seems to get larger and more competitive. There are several developmental races before and after the elite races and it is really awesome to see this sport growing with the younger athletes. The women’s race began began around 10:30AM. The swim was just below wetsuit legal temperatures at 19.3 degrees. I may have gotten warm in my wetsuit under the sunny skies in a 1500meter swim, but since it was only 800 meters, it was perfect. The swim had less dolphin diving than in years past due to the increase in rain in Florida the past year. I started off on the left hand side of the start buoy and found myself having to swim about 20 or 30 meters across the field to get to the buoy. The left side was slightly shallower, but I had to swim a little farther. By the time I got to the 400 meter mark in the swim, I was in second position, but Sara McLarty was about 30 meters up ahead. Returning to the shallow water, I ended up exiting the beach in fourth, but was pleased with my T1 and left in second position. 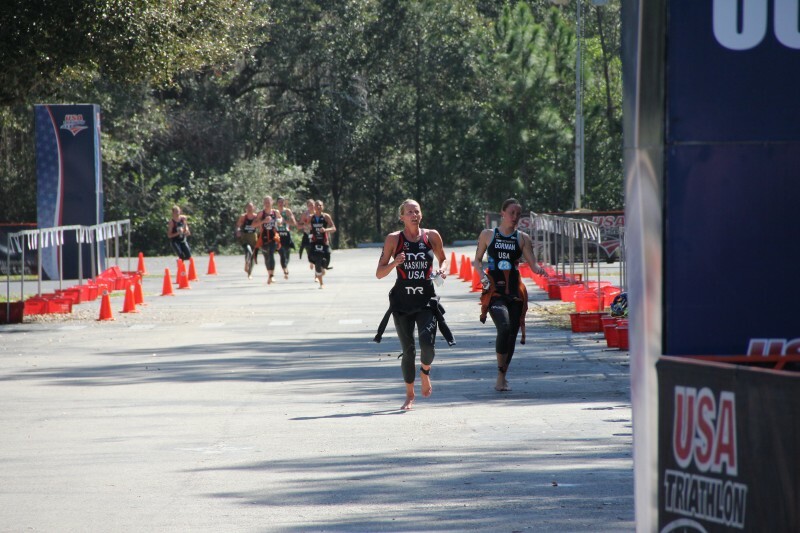 Exiting the water and running to transition was the point where my heart rate was most likely the highest throughout the entire race. Running in sand in a wetsuit is hard! Once on the bike course, I put my shoes on during the technical corners in transition and immediately hit the bike very hard the first three minutes. With about one kilometer into the bike course I caught up with Sara McLarty and the two of us worked together over the course of the 20k bike. We managed to put about ten seconds per lap on the chase group of around ten women. I felt strong on the bike and very pleased with my effort. I exited the bike with a 45 second lead over the chase. I knew that there were several fast runners in that group and still needed to press on the run to maintain my lead. The run course was a flat, two loop run with 180 degree turns at each end. The run is a great opportunity to see where your competition is at each turn. After lap one, my lead was cut back by 5 seconds. 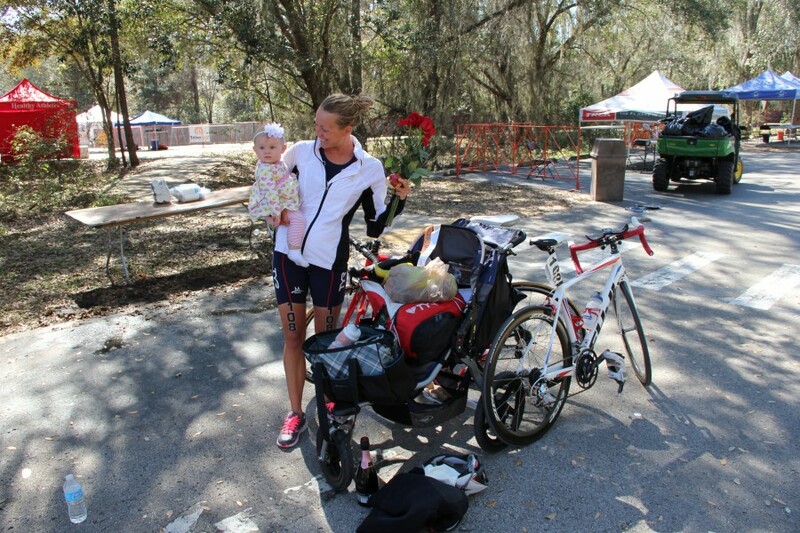 I knew as long as I was able to keep up the pace I was maintaining, I had a feeling I could break the tape. The last 400 meters, I felt strong and it hit me that I had won! 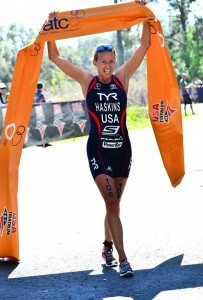 I had executed my race plan and accomplished my goals! 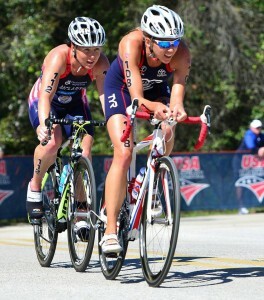 It felt awesome to be back to racing and pushing hard. These are the days that all the hard work in training really pays off. This is my tenth year of racing and what a way to return with my 30th career win. I can’t thank my family/friends/supporters and sponsors enough for all their support in getting me to the start line prepared. I know that this is just the beginning of a long season. I have lots of hard work ahead of me and look forward to that journey. The best part of this journey is sharing it with my family. 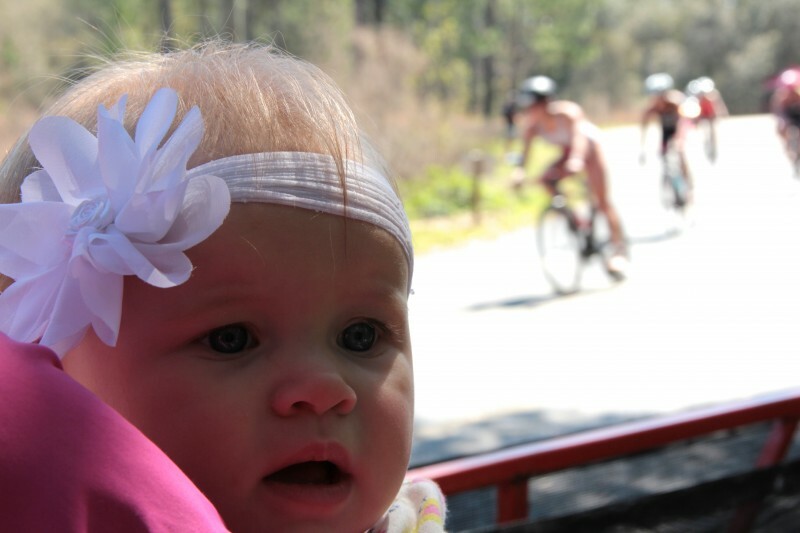 Caroline fell asleep at the end of the run, but by the end of the season, she may be able to say, “Go Mamma!”.